1. 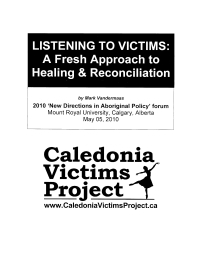 Why does the Caledonia Victims Project have the image of a dancer in its logo? The dancer image is a tribute to the pain and courage, and hopeful spirit of a young woman named Pam Dudych who, at the age of 14, became both an inspiration and a symbol of Caledonia’s nightmare when a friend of the family asked Canadian Advocates for Charter Equality (CANACE) founder Gary McHale and Caledonia Victims Project founder Mark Vandermaas to help her share her school project – a pamphelet titled ‘Road of Hope’ – with the people of Ontario. Road of Hope is a heartbreaking document that expresses her pain of living in fear on the Sixth Line after the Ontario Provincial Police withdrew policing services from residents to appease native militants. Pam was able to read from her project on video released on the internet; at the Queen’s Park Media Studio, and in front of Caledonians taking part in the Oct 08/07 ‘Remember Us’ March. In order to try to protect her identity, she was given the codename ‘Dancer’ because she loved to dance competitively. 2. 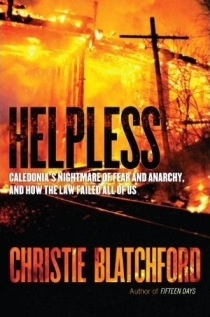 Is the Caledonia Victims Project part of CANACE or controlled by CANACE? What is the difference between the two? 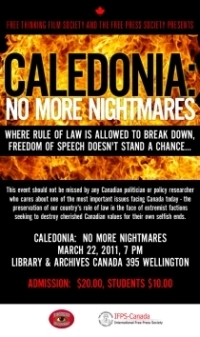 The Caledonia Victims Project is a completely independent organization founded by Mark Vandermaas who was one of the original co-founders of CANACE (Canadian Advocates for Charter Equality) along with Gary McHale. CANACE, however, does not have any ownership or controlling position in the Caledonia Victims Project. 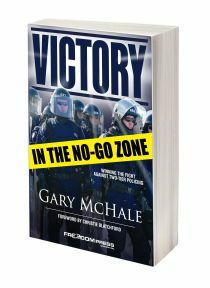 CANACE has become the most effective activist group working on behalf of victims in Caledonia via a combination of tactical activism in the form of protests, evidence reporting, and court actions (with startling success) intended to publicly hold the Ontario government and the Ontario Provincial Police accountable for the disastrous effects of racial policing practices. In contrast, the Project is focused on the longer term, strategic mission of influencing aboriginal policy through the documentation and sharing of evidence about victims of flawed policy and, more importantly, the lessons to be learned in order to facilitate healing and reconciliation. 3. Is my information confidential? While CVP director Mark Vandermaas continues to advise and consult with CANACE he is no longer a member or leader with the organization. He no longer has, therefore, a fiduciary relationship that would require disclosure. The very nature of the Project requires a high level of discretion in order to facilitate frank discussion. 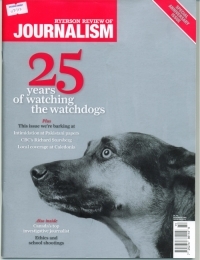 Victims, policy makers and influencers, and sources can, therefore, be assured of strict confidentiality. 4. Why do you not allow comments on this site? 1. It’s primary purpose is to provide an historical record of events and people related to victims of racial policing and aboriginal extremism; it is not a discussion forum for anonymous commentary which all too often degenerates into name-calling and generalized slurs. In the future, a discussion feature may be added, but all participants will be required to identify themselves prior to being allowed to contribute. 2. Due to the dramatic increase in demands on time, especially while the Project is under construction, there simply is no time to devote to responding to comments. One of the most important – and time consuming – aspects of it is the encouragement and gathering of victim impact statements, and this takes priority. In many cases, articles on this site will have an introductory paragraph on VoiceofCanada where comments are permitted – if they contribute to elevating the course of debate. If you have a genuine concern with a fact or statement you see on the Project website, you may email Mark Vandermaas at info@caledoniavictimsproject.ca.